Welcome, Sangi - we've all been wondering when that Coupe will land with someone who will bring it back to its glory! P.S How on earth can I attach pics for the rest of you to see..? To upload a picture you must be in "full editor" mode, not "quick reply" and you'll see two tabs below the text box "options" and "upload attachment". Pictures must be less than 512k and 1200 x 1200 pixels. Far easier IMO to use a third party host like photobucket and simply copy the [img] [\img] address. Sangi, if you mean the surrounds which fit over/around the headlights then I have spares I could let you have for £10 plus postage. I assume if you used PayPal it would sort out the exchange rates etc and allow you to pay in dollars and me to receive sterling? That looks a really nice car, much too good to break. Needs spring cleaning, even the damp mould will come off the (leather?) upholstery, ask me how I know. It's nearer to you than to Stephen (and Sangi has enough on his plate, wherever he is) so smuggle it across the border. A pity our lad is the other side in North Carolina,that has the prospect of being a really nice Scimitar. That looks to have the basis of a cracking restoration !!! BUY IT NOW - but offer just 1500$, spend the other 900 on geting it cleaned up and running and you've made a bargain buy !!! I don't really get the whole "bill of sale"/title process here. 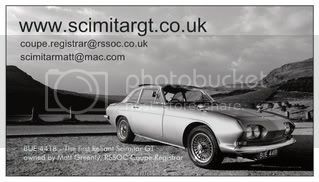 I met one chap with a Spitfire and it had never been allocated an off the road registration (SORN equivilent as far as I can figure out) so to get it road legal he had to pay the backdated registration fees (road tax). I'm suspicious now that any car with missing papers is going to be unusable. If it was nearby I'd have it for spares i think. Try getting a windscreen over here and it wouldn't be a good percentage of the purchase price of that. The sellers problem is that I'm probably the only person in the US who feels that way! philhoward wrote: Welcome, Sangi - we've all been wondering when that Coupe will land with someone who will bring it back to its glory! Looked into this too. Although Cateras appear to be automatic transmission only. scimjim wrote: Whereabouts in BC Darren? We relocated to the West Kootenays in a small town called Castlegar. Lovely mountain scenary, mild winter climate (by Canadian standards) and roads built for Scimitars! Already attended a few shows here with my SS1 while my SE5 is still stored in Manitoba until I am ready to restore. I too am in the same boat for a windscreen! I have one but it is in my folks attic in Cornwall! I could seriously use some parts, but that will be another Scimitar gone forever...I sincerely hope this car finds an enthusiast to save it. It is impossible to get this car across the Canadian border without a title unless it is parts only, meaning it could NEVER be put back on the road. The trouble I went through getting my titled SS1 from Alabama was bad enough. I paid over $4000cad for shipping and brokerage and the company still messed up. Was info on this car ever submitted to the registrar?